We’re feeling seriously wintry as we hit November – think cosy slouchy boots, oversized scarves and, for a treat we’re suggesting a dusting of cool new make-up. Avon’s latest make-up collection, Arctic Goddess, features a quad of sea blue eyeshadows, an icy pink lip gloss and three frosty nail polishes. Blue eyeshadow may seem scary if you haven’t worn it for a while, but Alesha Dixon, 34, (left) shows that the combination of matte and shimmering shades can really flatter eyes. Apply the light violet shade in the inner corner of the eye, then work the matte blue over the lid and blend upwards and outwards. The Avon ambassador keeps the rest of her face neutral bar a slick of Ultra Rich Brilliance Lip Gloss in Pink Icicle to make her eyes the focus. 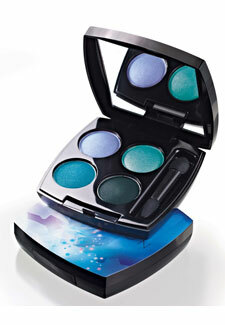 Avon Arctic Goddess collection launches in November at www.avonshop.co.uk with prices starting at £6.